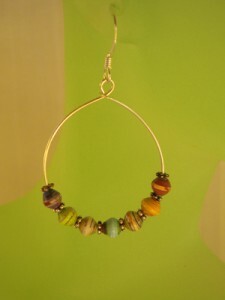 Earrings is something of a must have or must wear for me and I’m sure almost all women are. We can be seen without make up but not without earrings. 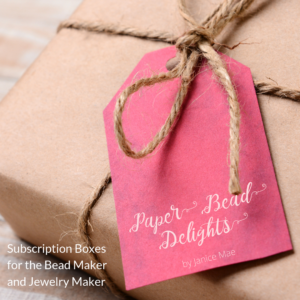 When you have everything at hand; ear wires, some paper beads, and findings you are good to go, you can make a new pair in 15 minutes or less. 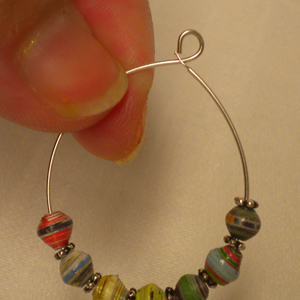 I made an oval hoop earrings using the round hoop earring finding and small paper beads. 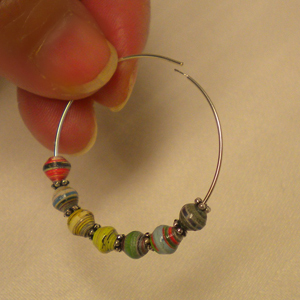 The materials are; hoop earring finding, ear wire, small round paper beads, daisy spacers and the tool you need is a round nose pliers. First you thread on the hoop your bead and daisy spacers with your desire number of beads. Next, using your round nose pliers bend the tip upward so that it goes into the hole of the finding easily. 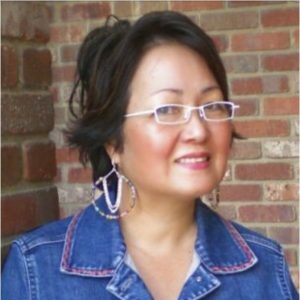 Push it so that the round shape takes the form of oval shape, tip should be around 3/4 of an inch sticking out from the hole. 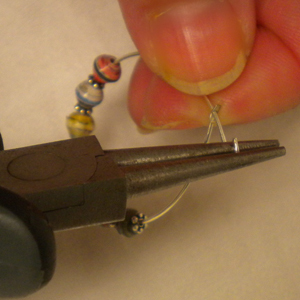 Take your round nose pliers and bend the tip towards you forming a loop. 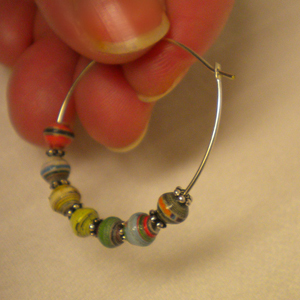 To finish, open up the loop on the earring finding and slide the finish hoop. I like the fact that the beads are free to move around. I think it will also look good if you add more beads. 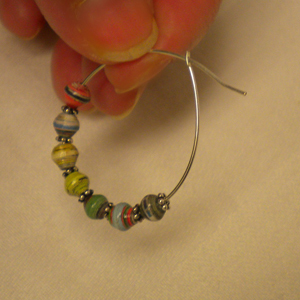 I have so many of these earring hoops…now I know just what to do with them…this ideas was so helpful. 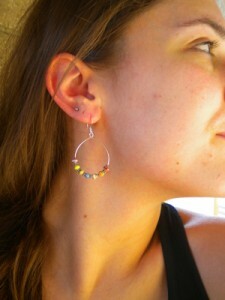 so lovely earrings with multicolored paper beads !